Beautiful ocean and mountain views with all the comforts of home. Gated community with security guards 24 hrs a day. 2 bdrm 1 bath and a large carport. Each room has a queen bed, and bathroom has a large shower. 3 separate AC/heater split units, so each room can have their own comfortable temperature. Granite counters and Stainless Steel appliances. TV with cable, DVD player (with small selection of movies), stereo, and a PS3 (with a handful of games). Brick patio in the backyard with great afternoon shade overlooking the ocean. BBQ and outdoor chairs. Great place to sit, relax, and enjoy the tranquility of Baja California. As a renter, you're allowed to use all facilities that El Dorado Ranch has to offer (championship golf course, 3 swimming pools, 2 hot tubs, 6 tennis courts, 4 pickleball courts, and private beach access). My name is Marcel, and I currently live in San Diego, CA. I was born in Brazil and moved to the United States when I was 11 years old. I've lived in several cities on the West Coast, but mostly in California. I purchased the land in Mexico in 2006 and had the house built in 2007. My goal was to have a home in Baja where I can vacation as much as possible, and possibly retire when the time comes. I hope you can enjoy your vacation in my home as much as I do. Very clean, modern and quiet. We came down for our December birthday’s. We were greeted with a bottle of wine and warm wishes. That was a nice touch. We would definitely come back. Had an excellent time, would come back again. Beautiful, comfortable home with everything we needed. The views of the sea and mountains at sunrise and sunset are amazing. There is a saguaro cactus just outside the front BR window where a woodpecker sleeps at night. He sings and flies out every morning! Charming! We brought our bikes, kayaks, hiking boots, water weights for water aerobics and yoga mat. We used them all! And a great jetted hot tub at the pool to recover in! Everyone was so nice-a neighbor gave us coordinates for some great hikes-a waterfall and cone caves! 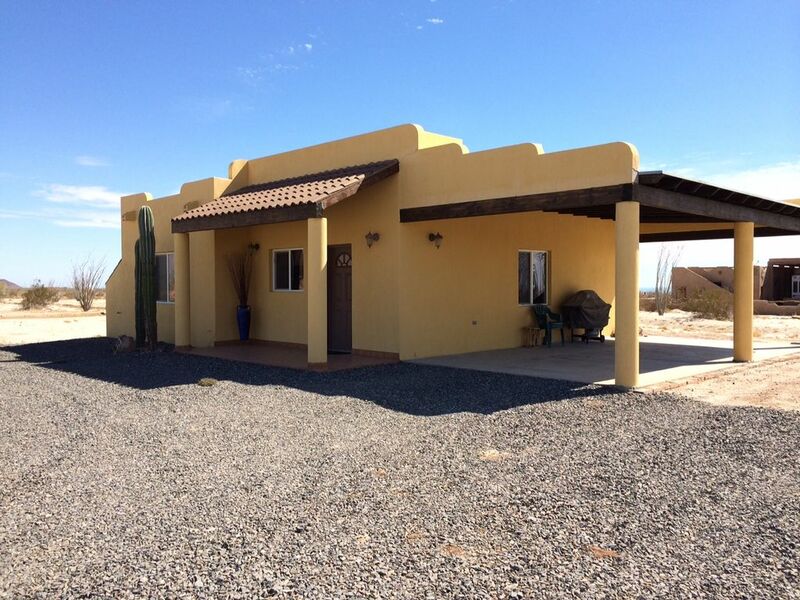 I needed a place too stay while my house in San Felipe was being completed. Casa Droado is just a few door down from My home so it worked it perfect. Clean and nicely appointed. I rented for 2 months but only needed to stay for 2, the owner promptly refunded the 3rd months rent. For rentals of one month and longer, renter will be responsible for water and electricity (roughly $50 a month).